Funk emerged in the 1960s, a scorching sound that amped up the spirit of R&B and became the precursor to hip-hop. While major artists topped the charts with funk hits throughout the '60s and '70s, What It Is! celebrates the smaller ones—the heady, groove-monstrous strain of gutbucket funk that remains a major force in American music. A four-CD, 91-track compendium that would take incalculable hours to assemble from dusty bins at disappearing record shops, What It Is! is culled mainly from the treasure-filled vaults of Atlantic, Atco, and Warner Bros. Records. It's an unprecedented shadow history of funk, pulling together rare sides from well-known artists and definitive grooves from less-known but supremely gifted masters of the art form. Artists include Watts 103rd St. Rhythm Band, Eugene McDaniels, Baby Huey & The Baby Sitters, Allen Toussaint, Little Richard, Labelle, Eddie Hazel, Earth, Wind & Fire, Lulu, Wilson Pickett, Malo, The Meters, Cyril Neville, and many more. Deluxe packaging houses a massive booklet with rare photos, liner notes, and track-by-track commentary. A righteous undertaking of great magnitude, What It Is! Funky Soul and Rare Grooves trawls through a decade-long stretch of the Warner-distributed archive -- taking in the catalogs of Warner Bros., Atlantic, Reprise, Atco, and smaller nodes like Cotillion, Curtom, Alston, and Jonie -- and pulls up 80 soul/funk truffles, almost all of which were left for dead shortly after release. While many of these cuts have been repurposed as vital ingredients of hip-hop tracks, which has in turn fostered a voracious collector's market (it would cost a fortune to collect these songs in their original formats of release), the box is a leagues-deep trawl through an otherwise forgotten past. There are few well-known names on these four discs, but even they tend to be represented by selections that are not obvious. Curtis Mayfield's "(Don't Worry) If There's a Hell Below We're All Going to Go" is likely the best-known inclusion, and after a substantial number of cuts that can't be considered truly rare, there's a sudden drop into (sweet, sweet) oblivion -- unless you're of the small minority whose spines tingle at the sight of names like Grassella Oliphant and Rasputin's Stash. The chicken-scratch guitars, wild Hammond B-3 runs, group chants, and blaring horn punches are served by the dozens, but the box also illustrates an evolution that took place through the '70s. Since the sequencing is, for the most part, chronological, those changes are all the more perceptible. Funk Factory's "Rien Ne Va Plus" and Faze-O's "Riding High" churn and float slowly, steeped in synthesizers, electric pianos, and studio effects, while legions of artists have attempted to replicate the sound and spirit of Stanga's "Little Sister" and 6ix's "I'm Just Like You" -- two songs graced by the hands of Sly Stone in tripped-out, otherworldly There's a Riot Goin' On mode. It's not one big party, either. Check Baby Huey & the Baby Sitters' harrowing "Hard Times" (written and produced by Mayfield), where the poor and paranoid protagonist subsists on Spam and Oreos and keeps his curtains drawn so he won't see those who peer in on him. The themed playlists and imaginary compilations hiding within this compact box are innumerable, bound to take the average overthinking funk freak to new levels of nerd-dom. There are region-specific sets to be made, as well as sets with possible titles like Latin Funk and Flute Funk and The Early Arrangement and Production Work of the Late Arif Mardin, in addition to a remarkable batch of covers, a tight collection of instrumentals, and a not-very-exclusive list of tracks that have been sampled throughout the years. The accompanying booklet could be sold separately, as it contains scads of seldom-seen photos and scholarly track-by-track notes. Rhino also deserves applause for resisting the urge to house these discs in a massive synthetic afro or an oversized wah-wah pedal. You can snugly tuck this thing between your arm and chest and sense its power run through your whole body. Bring on a second set that extends past the disco era and involves the likes of Slave, Mass Production, Brides of Funkenstein, and Dinosaur. I have been shopping the blogs for some old compilations that I used to have but, for one reason or other, have gotten away from me over the years. Among the ones that I found is this little gem from around 1991. 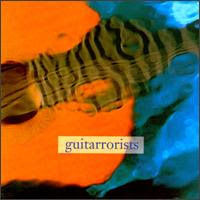 "Guitarrorists" is a compilation of instrumental pieces by some of punk/underground music's most cutting edge guitar players. Each does what they do best while showcasing the sounds that them so recognizable. There's not much to say about this album, otherwise. The line-up here speaks for itself. Among the players featured are Sonic Boom, J. Mascis, Helios Creed, Thurston Moore, Paul Leary, Nikki Sudden, and Kramer from Bongwater. My personal fave is Steve Albini's "Nutty About Lemurs" track. Here Albini gives us a taste of pretty much every trick in his bag! Back in about 1998 or so I ended up seeing his band Shellac at a strange little place in the small town of Cookeville, Tennessee. It was a pretty intimate setting and between songs Albini announced he was taking requests. I was sitting up front so I decided to yell one out. I thought I would pick something obscure that no one else would probably be asking for and "Lemurs" was the first one to pop in my mind. I yelled it out and after giving me sly grin he went into it and played the entire piece. Anyway, I thought Michael (Zer0_II) would enjoy this one and I'm sure a lot of you will also dig it. What should be the punishment for someone who hijacks a tribute blog for their own selfish reasons? A harsh verbal warning? Banishment? To be hanged, drawn and quartered? No! How about their own tribute blog post? And who said crime doesn't pay? Thanks to the recommendation of fellow blogger, NØ, We're Late For Class drew my admiration instead of my fury. I strongly urge any fans of experimental psych-rock, fans of legal downloads, and fans of faded, black XXXL t-shirts to check them out. But don't take my word for it; read it straight from the horse's mouth. "We're Late For Class is an improvisational psychedelic college collective who've been posting free albums on line for over 2 years. Another Collection is their 40th. 2-CDs, 142 minutes, of uncharted improvisation and drug fueled excess, including a seance with Jim Morrison, a musical romp with O.J. Simpson, a homage to producer Jimmy Miller, the theme song for a low budget cable comedy sketch show, one too many accidental nods to Hawkwind and stoned tributes to Ali, Guess Who guitarist Kurt Winter, Pink Floyd and whatever was on the box that given weekend. It's all culled from their previous 19 releases (#21-#39). Last year's #20 A Collection features highlights from #1-#19. WLFC is also prone to 20, 30 & 40 minute space jams, but didn't have the space to include any this time. The best part? It's all free for the taking. You can find We're Late For Class at any local hash bar or at their blog, We're Late For Class"
Greetings Digital Meltd0wn readers! I’m really honored and excited to contribute to this blog and I’d like to start my guest blogging here simply by thanking Zer0 for all the work he does for the music-blog community at large. Today’s offering is a bit different from a lot of the posts on Digital Meltd0wn. The actual compilation being offered is entitled “Out of This World Flying Saucers “ and it promises to be “A compilation of 31 of the all-time best flying saucer novelty recordings.” As host of a sci-fi radio show I couldn’t pass this up. Upon its arrival I realized something about this compilation; yes, it is a compilation of flying saucer novelty songs, however, the majority of cuts featured on this compilation are from the “break-in” records that were so popular in the late fifties/early sixties. I offer the compilation in full, but I want to say a bit about the “break-in” recording and its place in musical history. Break-in recordings are, perhaps, the starting point for the “sampling debate” we find still continuing in the realm of contemporary music. As such, they are a rather fascinating bit of music history. The first thing we should probably do is to offer an idea of just what a “break-in” recording is. Essentially, “break-in” recordings are a specific type of novelty song. The gag is this: usually there is a brief clip of a song playing that is interrupted for some important breaking news (the break in). From there, it cuts to a reporter who is interviewing eye witnesses of an event, various experts about the event, or sometimes even fictional characters about whatever the breaking news has been reported to be. The responses to the reporter come in the form of snippets from popular songs of the time; in other words, there isn’t an actor playing the eyewitness, instead, you hear samples from various songs played back that respond to the reporter. That, in a nutshell, is what a break-in recording is. Bill Buchanan and Dickie Goodman are often credited as the originators of this type of recording. Their first “break-in” recording (and, really, THE first) was the 1956 hit “The Flying Saucer” (this usually appears on compilations, including this one, as The Flying Saucer (Part One) and The Flying Saucer (Part Two). This recording became wildly popular and spawned a league of others who were keen to get in on the “break-in” phenomenon. Now here is the interesting bit. Think about what Buchanan and Goodman are doing. This is long before sample-based hip-hop or electronic music enters the scene. As familiar as we are nowadays with sampling in music and audio entertainment, Buchanan and Goodman were innovators at this time. Some claim The Flying Saucer to be one of the earliest if not the earliest example of sampling within a pop recording ever. If nothing else, it seems to be the first recording that relies upon sampling that reached such a level of popularity. So did this go without controversy? Of course not. Copryright lawsuits were just around the corner for the originators of the break-in record. However, the results of the legal proceedings may surprise you. A judge ruled that the Goodman’s work could be properly classified as burlesque/parodies and should be considered as new works in-and-of-themselves. The various lawsuits facing Goodman were, apparently, settled out of court after this decision. However, it seems that this case is one of the first, at least to my (limited) knowledge, legal cases where the art of sampling was defended within a court of law. The point of all this? Well, the point is more historic than anything else. I just found it interesting that we can easily trace the sampling debate all the way back to the fifties. That said, here is the track listing for this compilation. Note: not all of these are break-in recordings. The Jesse Lee Turner track “The Little Space Girl” is simply a novelty recording and there may be one or two others that are not break-ins on this compilation.